With so much negative going on in the world, it’s nice for a change to read something inspiring. My favourite kinds of stories are the ones that make me smile and touch me enough to shed a tear. I tend to gravitate towards uplifting sites because they help me keep a positive outlook. I recently discovered Rare People, an online publisher of feel-good stories from all over the globe. It’s exactly the kind of site I’m drawn to and if you are like me, you’ll want to bookmark it so you can check out their stories on a regular basis, too! 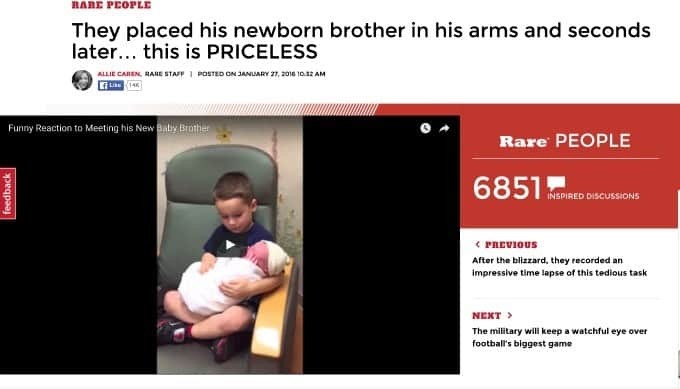 One of the stories shared by Rare People recently was a young boy meeting his newborn brother for the first time. He was carefully placed in his arms and all was well till the baby let out a little cry. The reaction on the older brother’s face was priceless! It made me instantly smile and chuckle. Kids are so funny sometimes. 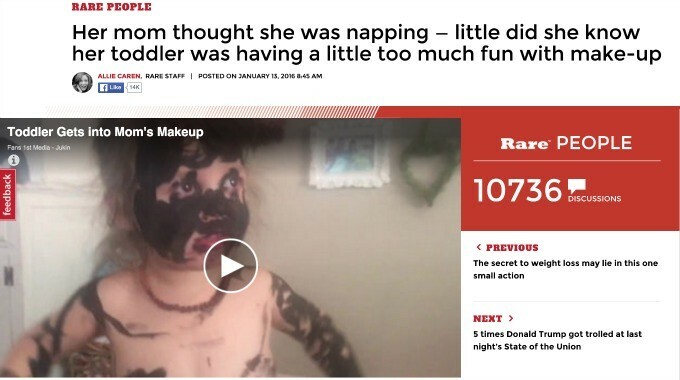 Another funny and relatable story was the one where the little girl was supposed to be napping, but instead went nuts in mom’s make-up bag. Boy, was she a sight to see! I hope mom had a lot of soap and wash cloths. I remember Olivia doing something similar with my make-up when she was a toddler. Fun times! 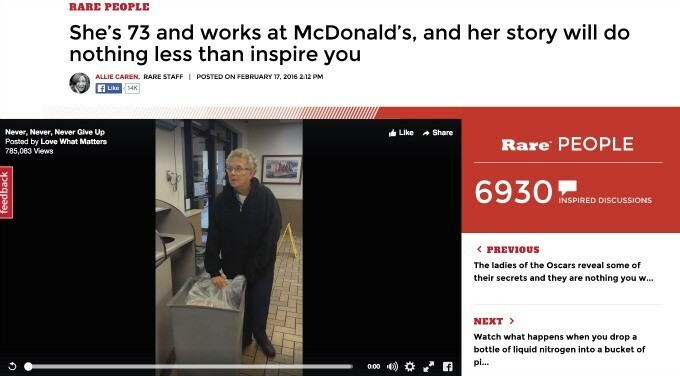 The story of Charlotte, a 73 year old worker at McDonald’s, is truly inspiring. Not only does she work hard at her job, but she does it using only her right side. She suffered a stroke at age 25 leaving her left side completely impaired. She’s a reminder to never give up! If these sound like the types of uplifting stories you like to read, I encourage you to subscribe to the Rare People email newsletter. This way, you’ll receive a daily email featuring all the wonderful “Feel Good” stories to help brighten your day. And don’t forget, smiles are contagious! I would love to win this awesome prize!It would be so appreciated. Thanks for the great opportunity, my family could really use this. We live out in BC and are travelling back to Ontario to see family coming up, but primarily to see my grandparents as my grandfather is not doing well and we want to be sure to get there to visit as it’s been five years.